How to Become a Forensic Scientist in Michigan? How much does a forensic scientist make in Michigan? With the State of Michigan ranked at no.13 among the most dangerous states in the United States (World Atlas), the field of forensic science is becoming more and more important as an aide to law enforcement. The Michigan State Police hires forensic scientists to perform a number of duties such as the identification of mechanical devices, tests of various sorts, chemical analyses and analyzing liquids and physical substances for criminal prosecutions. These forensic scientists work in collaboration with other law enforcement departments within the Michigan State Police to investigate different sorts of crime scenes and collect physical evidence for further processing in the lab. If you want to join the ranks of these professionals, the following information on how to become a forensic scientist in Michigan would be of great use to you. If you possess these characteristics, you might just want to consider a career in forensic science. The exact requirements you would need to fulfill to become a forensic scientist in the state of Michigan would vary according to the position and organization you are applying for. Requirements may also vary at the local, state and federal levels. The following steps are therefore meant to be taken as general guidelines. The first requirement you would need to fulfill is getting the minimum level of education needed for entry level positions. A bachelor’s degree in criminal justice, physics, chemistry or biology would be the ideal place to start. These 4-year long programs would help you create a solid foundation for most entry-level jobs in this field. 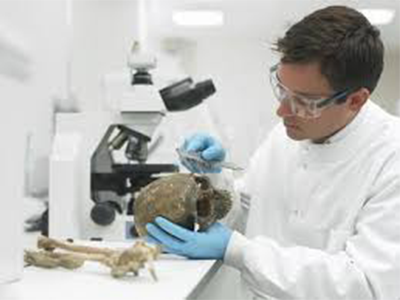 If the college offers courses in forensic science, you are advised to opt for them. This might be a requirement of your bachelor’s degree in some cases, but even if it is not, you are advised to complete a relevant internship. This would give you the opportunity to network with the professionals in the industry and observe the investigative process firsthand. You may find internship opportunities at your local county government, local police departments or federal agencies. Even though this is not a requirement for most entry level jobs in forensic science, it is still recommended that you consider obtaining a higher degree. Masters in forensic science for instance, could help open up a lot of advance level positions for you in this field. You may be studying subjects such as serology, microscopy, ballistics and toxicology along with further specializations in chemistry, biology or anthropology. Once you have met all the basic requirements of becoming a forensic scientist, you will have to get a job. Your best bet is with the city, county or state crime labs. You may also find employment with the Michigan State Police. Getting certified is likely to improve your prospects as well as add to your overall skill set and knowledge on the subject. There are multiple certification options for forensic scientists, such as The American College of Forensic Examiners International, which offers the Registered Investigator (RI) credential. To be eligible for a certificate program with any certifying body, you will need to fulfill some requirements. Make sure you do your research well and know what you need to do before applying. 1 – Forensic Scientist 9: This is an entry level position, where you will be a trainee carrying out different assignments while learning on the job. 2- Forensic Scientist 10: This is an intermediate level position where the employee is required to perform several professional forensic scientist assignments. 3- Forensic Scientist P11: This is an experienced level position where the employee is supposed to perform a complete range of professional forensic scientist functions. A considerable amount of independent judgment is required at this stage and the assignments completed here have a significant impact on other services in the system. Even though guidelines are typically provided, jobs at this level require a great degree of interpretation and adaption to determine the due course of action. 4- Forensic Scientist 12: This is an advanced level position where the employee functions as a lead or senior associate. Employees at this level are responsible for overseeing the work of other professionals or deal with complex assignments, as defined by the Civil Service. According to data from O*NET OnLine, Forensic Science Technicians made a yearly median income of $69,680 in 2017. This is significantly higher than the national median of $57,850. The State of Michigan is also a great place for forensic science technicians to work because of the positive 17% growth rate the occupation is expected to experience in the coming years. However, bear in mind that the competition is going to be tough. Candidates with master’s degrees or higher levels of experience may be given preference.